The first week of June is the National Doughnut Day to celebrate the men and women who served doughnuts to World War I soldiers. Thanks to this a couple Bloggers and now even Zagat did their list of top fried dough delights, so we took the chance to try some of them. G&C sources several cafés and places around London, they even have a map on their website so you can know when and where are their doughnuts. We got a double chocolate one during our visit to Timberyard. Chocolate dough filled with chocolate ganache, really nice filling, and lovely twist. The classic ones, created by Justin Gellatly now founder of Bread Ahead. They source to different locations but nothing like going on Saturday morning to Druid St to get a couple of them directly in their bakery, make sure to buy at least 2 as 1 won't be enough. I lost count on how many I have had so far, the latest one I got a rhubarb one, nice filling, and keeping the original recipe. 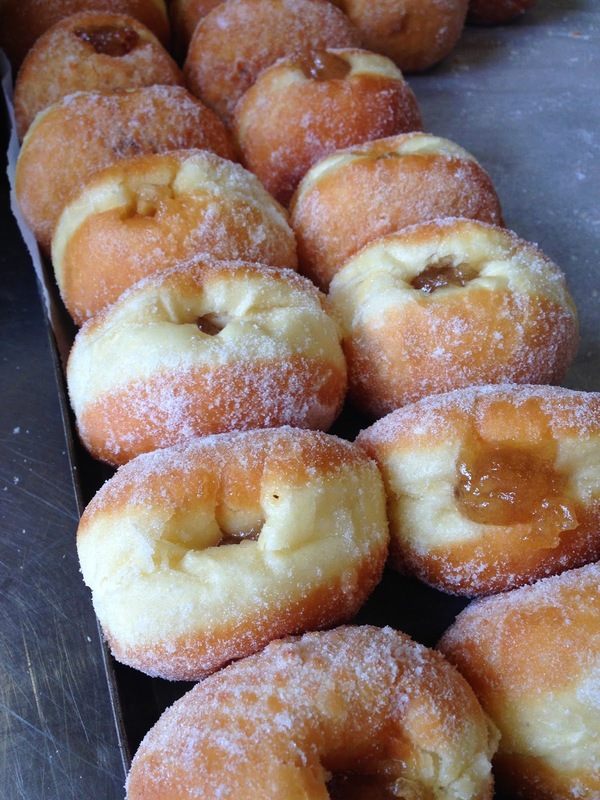 If you don't want the hassle of going to the flower market on a Sunday and to buy their doughnuts on the front door of the MacDonald's residence, then you can head instead to The Lockhart from Friday to Sunday and get your stash there. We tried salted caramel and lemon fillings, both were brilliant, lovely filling, a perfect treat. Justin left St. John to join forces with Matt Jones and opened his bakery and baking school to bring us artisan breads, brownies, and the delicious doughnuts. Their stall operates in borough market, the options available when we visited on Saturday were Vanilla and Salt Caramel. Great flavours, spotless, a must sweet treat in the market. If you dare to incursion into Harrods and hassle with all the tourist there, you will find the counter selling Dum Dum in one corner of the food court. These are the light option of the bunch as they are baked instead of fried. Plenty of options available, including a traditional take. 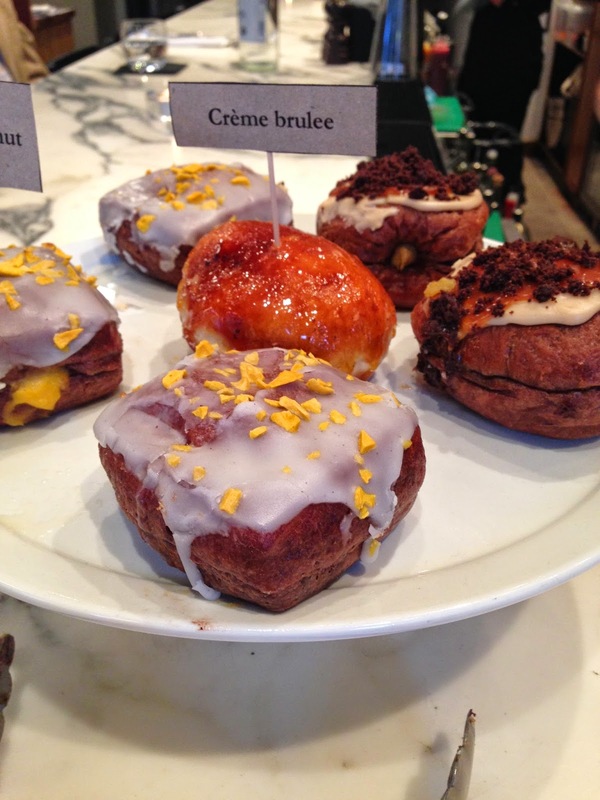 We got the Zebra cronut, the Almond Creme and Pistachio, and finally their Harrods exclusive Berry Meringue. They were ok, some good ones others not as good. A fairly new concept that launched in May this year. Trading in Leather Lane Market and a store and delivery option in the horizon. Handmade daily, clever creations, gourmet style with fresh ingredients. We got the Sea Salt Caramel and Banana and it was superb, this is brilliance on a plate. Nice tea and coffee place with two locations in London, Farringdon and St Paul. The doughnut there is actually a duffin, a mix between a doughnut and a muffin. They only have them from Monday to Friday and they sold out quickly. Really nice, not overpowering, quite subtle. Be sure of going early as they will sold out.